This spring I was given a bunch of giant sunflower seeds from a relative. They may be mammoth? I really don't know. All I now is they're taller than me and the flowers and seed heads are bigger than my head. Until I learn otherwise I'm just going to call them the Big-A** Sunflowers! He told me a lot of the harvested seeds won't germinate so I should try to germinate a few and then plant which ones do grow into seedlings. 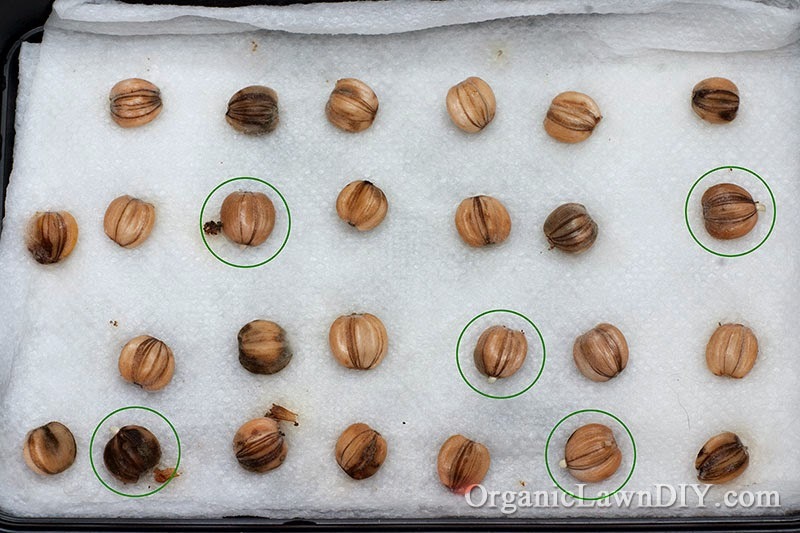 Because he planted a bunch of seeds this year and none of them germinated my plan is to germinate a couple of dozen seeds on moist paper towels to see if they sprout and then plant them. I'm using a cleaned, used take out container that I lined with a couple of sheets of folded paper towels. In a spray bottle I mixed 1 cup of warm water and 1 teaspoons of hydrogen peroxide and then sprayed the paper towels until they were thoroughly moistened. 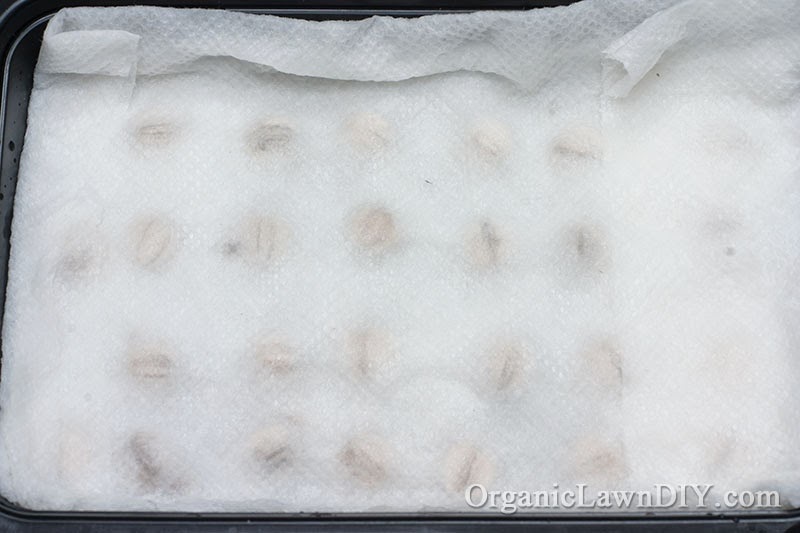 Spacing the sunflower seeds about 1" apart on the towels I was able to get 26 seeds in the tray. 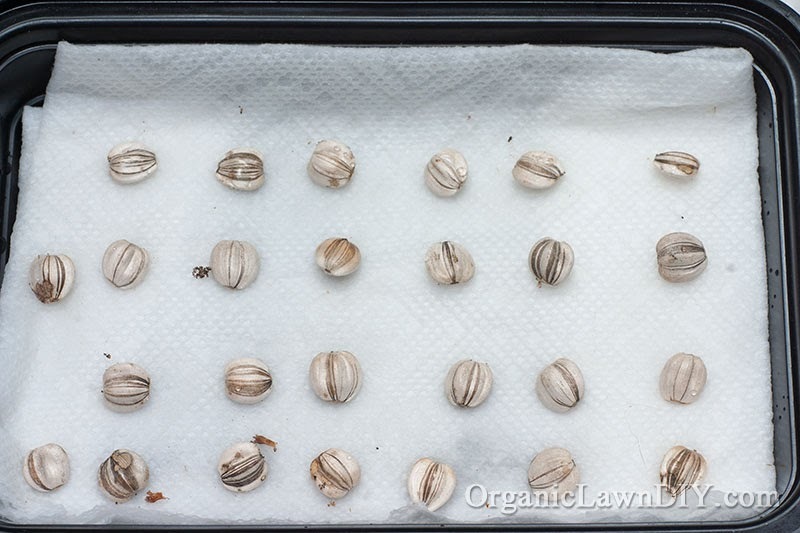 I placed one more folded paper towel over the seeds and sprayed it with the water and hydrogen peroxide solution to moisten it. After the top towel was wet I pressed it down so it had good contact with the seeds. Let everything sit for a minute and drained off any excess water before covering it with the lid. The next night (about 30 hours later) I checked on the seeds and was surprised to see that some of them sprouted. I still haven't decided where to plant! Here's a close-up of some of the sprouted sunflower seeds. There's some fuzz on some of the seeds. It may be a mold or fungus or it might just be residue from the paper towels. The bottle of hydrogen peroxide I used was over 6 months old and opened. I'm going to get a new bottle tomorrow and soak the seeds for at least 30 minutes and then rinse them before I plant them. Can't wait too long to plant them or the roots will start growing in the paper! More may sprout in the next day or so but 5 is fine for one location. These things are fairly huge and I don't have a lot of free space for them. I'm going to pick a spot where I want one plant to grow and amend the soil with some compost. 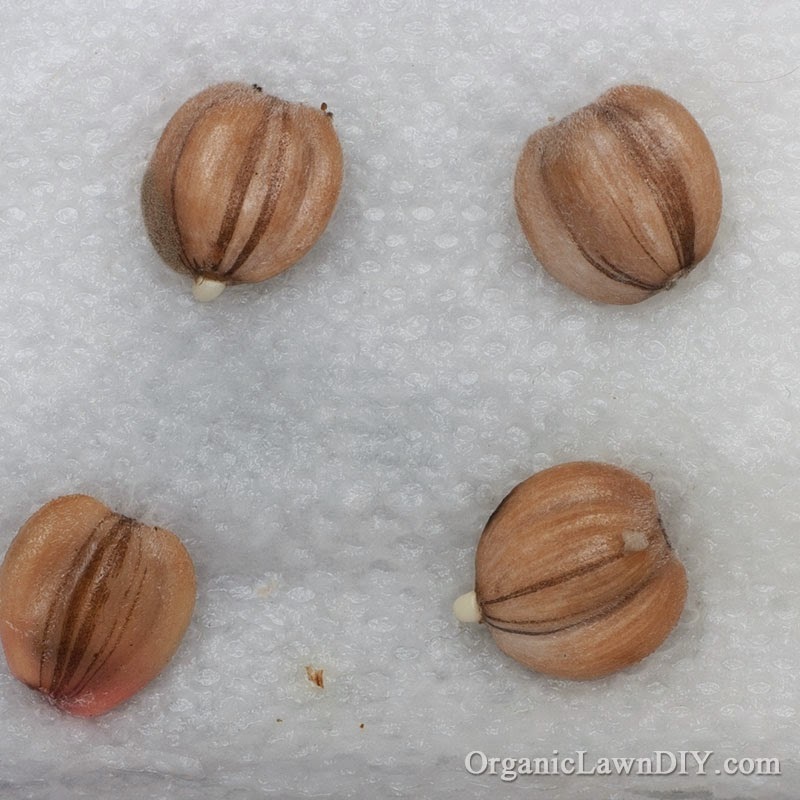 All 5 seeds will go in the same spot to grow into seedlings. I'm not sure but I think I can just lay the seeds on their sides and that white tip that's sprouting will grow down. Plants are kinda smart, they know which way to go. After the seedlings reach about 3-4" in height I'll thin out a couple of the weaker looking ones. When the remaining seedlings grow to 1' in height I'll thin them down to 2 plants. At 2' in height I'm going to have to have a difficult conversation with one of them because I only have room for one. Update: 5/26. When I finally got around to planting the seeds another one sprouted so I had 6 to plant. The next day I noticed some digging in the spot where I planted the seeds and thought a squirrel or other animal might have dug them up. I have a little landscape helper it seems. Sometimes when I plant something they'll let me know if they like it or not by digging it up! Luckily, three little sunflower seedlings emerged about a week or so later. It's been about 20 days since I first started soaking the seeds and the sunflowers are maybe 3-4" tall.